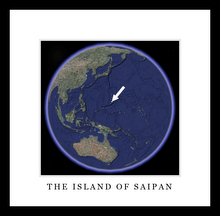 Saipan On NBC Nightly News! Some of my friends and family members probably wonder why I am the way I am, why I enjoy wandering the planet and putting myself in unusual places like small fishing villages in Belize. for a hot cup of Joe and to check my email. The fishermen are already out along the shore working on their boats. Less than two weeks until lobster season opens and that’s what these guys live for. I hit the dirt road walking, with a plan I formulated over coffee. I’m going back to Dylan Sosa’s house where I had a good but Spanishly difficult interview with a fisherman and his two fishermen sons. There’s definitely not as much English spoken here as in other parts of Belize, and I’m feeling rusty. It’ll come back. My plan to confirm this list of names of fishermen who fish in the South is temporarily derailed when I pass a “tortilleria” aka the local totilla-making shop called (translated) the "Speedy Tortilla Shop". Now I undrestand what that woman I interviewed two days ago meant when she said, “It’s a good life here in this village. We have everything: a school, a store, and a tortilleria.” It’s a small wooden building with a vent on the roof and I can’t help but poke my head in. 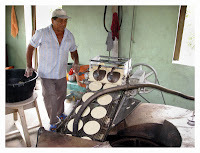 I start chatting with the old man who explains to me how they make these corn tortillas. 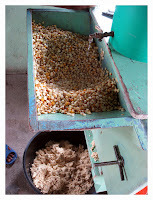 He’s feeding corn kernels through a grinding machine and a doughy substance is coming out below in a catch bucket. He tells me they get their corn from the German Mennonite community in Little Belize, not too far from Sarteneja. He asks me if I’m from Mexico and compliments me on my Spanish, which makes me feel good because I had a rough day with the language yesterday. 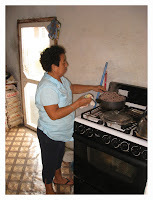 He tells me to come back in an hour because they are going to turn on the oven and start making the tortillas. I walk out and remember my plan: Dylan’s house, check the names. I forgot to do that when I was talking to him yesterday. I arrive at the house, and nobody’s outside. I knock on the downstairs door and they tell me to go upstairs up the outside staircase (interior staircases don’t seem to exist here). I go upstairs and can’t see through the screen door but I hear a voice and out comes Dylan. He seems glad to see me, and I ask him if I can get the names of the other southern fishermen to compare those names to the names on my list. He sends me downstairs and we sit on the stairs chatting. My list is good; I’m only missing one name. When I ask where these guys live, he starts to tell me but then says “I’ll just show you.” He yells to a woman downstairs to see if we can borrow a bike. Next thing I know I’m riding down a dirt road on an old rusty single speed fat tire beach cruiser with a seat that’s way too low and cruiser style handlebars, notebook in hand. He’s chatting as we go along, and then we stop at one house, and he yells to a guy about a bike, then he takes the third bike and points out a house down the road where one fisherman lives. Then we ride back to the house, and leaving the bike I was on, I resume on the 2nd bike he had just borrowed. This one fit’s a bit better but has one half-flat tire and a pedal’s missing which makes it hard to pedal in my sandals but most everybody else is cruising around barefoot, so I think I'll be fine. We wind through the unfamiliar, typically car-less dirt streets lined with mostly unpainted cinder block houses, a thatched roof here and there, and flooded yards form the big storm the other night. Everything looks the same to me. He points down one street, says that’s so-and-so’s house, then we ride, I happen to take mental note of a church or a store that I had seen before. Teobaldo lives THERE. We continue, turn, turn again. Romeldo lives THERE. “OK“, he says, “now you know where all the guys live, you can use this bike today and just bring it back and leave it at the house when you are done.” I realize that we’re back near his house, and he bids me farewell. I manage to negotiate my way back to the first house, and a young guy with 2 kids is outside and walks up to me (picture Gringo on local bike carrying notebook). Now at this point I forget who lives here, because I just got the tour of 4 houses and 4 names and they are all mixed up in my head. I say that Dylan told me that a fisherman who works in the south lives here. He says, yah, its his dad, and I figure out it’s the house of Antonio. One down … but he’s out, and I should try to come back this afternoon. He should be back then. I pedal away, wind my way back by Dylan’s house and hope I can find the others. I remember the pink house, so I stop there and an old lady comes out and after a little wrangling I figure out it’s the house of Armando. But he’s not here, he’ll be back in the afternoon. Two down. I pedal on, and think I remember the third house. I get it right, amazingly, and now its down to two names so I guess and ask for Teobaldo and my 50-50 chance paid off. And he’s home. But he’s working on the roof on this little shelter-like addition on the side of his house. He says to come back tomorrow early in the morning. Before 8. The earlier the better, because he has to work on repairing his cooler. 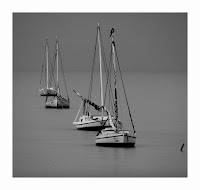 The fishermen have these huge iceboxes that they keep on the sailboats to store their catch in. Three down. 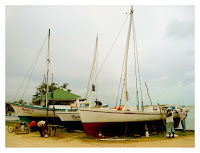 I pedal away, noticing that all the fishermen seem to be out and about making repairs to coolers, to the “cayuko” one-man canoes that they stack 5-high on their wooden sailboats, or on the boats themselves. I stop at the corner house. I really can’t remember where this last one was. I ask if Romeldo lives here. No, they say, next street up. On the corner. I pedal on. This house has a gate and a fence and I can hear the TV on through the windowless cinderblock windows. I yell “hello!” and “good morning” in Spanish a few times, to no avail. I reach through the fence, undo the latch, and walk up to the front door. Is it OK to just walk up to someone’s gated house like this? I knock and yell hello. I hear something, then notice the door knob turn then turn again slowly like something out of a low-budget horror flick. It opens, and a young guy in his 20’s greets me. I ask for Romeldo and he says its his father, that he’s not home. But then he invites me in. I kick off my muddy sandals and walk in. His young daughter is swinging in the living room hammock watching cartoons. He seats me in a folding camp chair with some torn flower patterned cushions on top. We chat a bit, I tell him about my study, and he seems interested. He’s a student at the University in Belmopan and is studying nursing. He knows the professor of natural resource management that I met on my dive boat last weekend. He tells me that he went out fishing a few times with his father, but then decided to continue his schooling. We talk a bit about protected areas. Eventually I get up to leave and he over-politely bids me farewell. As I close the outer gate yells to me and asks if I eat mangos. “Of Course!” I say and he re-emerges with a bag of gigantic papaya sized “Apple Mangos” that are from his dad’s “milpa” or farm. It turns out to be his grandfather’s farm, but his dad still keeps it running. Another example of grandfather-farmer, father-fisherman, son-something else. It’s funny how you get information like this just from something like a gift of mangos. Four down. I pedal on, mangoes in hand. 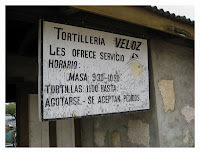 I head back to Dylan’s house to return the bike and, smelling something warm, I suddenly remember: the tortilleria! There are a few people lined up to buy fresh-from-the-machine tortillas. I walk in, they greet me warmly, and I ask if I can go behind the counter to take some pictures. The old man feeds the dough into the machine, the dough gets pressed, cut into circles, and flopped onto the rotating flat metal feeder that goes into the oven. On the other side fresh warm corn tortillas emerge, piping hot and perfectly browned, and feed onto a wire conveyor belt to the awaiting hands of the 2nd of 2 employees who collects them, stacks them, and then weighs and packs them for the awaiting customers. The old man asks me if I want to try one, and then pulls one off the conveyor belt, rolls it very professionally between his dark, flour-covered hands and hands it to me. One word: DELICIOUS. I get on the bike smiling, thinking about how lucky I am to be here, doing this intentionally random type of work. Besides my somewhat formal interviews, I am also here to do something called “observational ethnography” and it entails just living somewhere a while and getting a sense of the place and how it works. I’m going to like this, I think to myself, as I return the bike to Dylan’s house. Walking back past the tortilleria, I can’t resist and stop in again, this time with a $2 Belizean bill in my hand ($1 US) and ask for a pound of tortillas not knowing how much it will be. It’s a huge stack, so I tell her to halve it. She does, I get BZ$1.25 back in change, and walk back home with a bag full of hot, fresh tortillas, munching on one as I go. 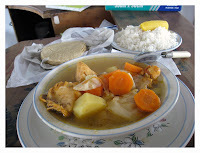 I head back to Antonia’s where my homemade chicken and vegetable soup lunch is ready and waiting for me, which I eat with my stack of fresh tortillas and my usual “Fanta Orange” out of a large 500mL glass bottle. Have you ever been traveling in a foreign country and been afraid to drink the water? I have. Especially when the guidebook says, "Tap water in [country] is not safe to drink." But then the locals say they all drink the tap water, and you're not really sure what is safe and who to trust. When I was in South Africa recently, I kept hearing things like, "Well, you CAN drink the water here ... but I don't." That's what's happening to me now, as I'm working and traveling through Belize. Before I left, I bought this little gadget that I really want to write about, because it's so useful, and (hopefully!) effective, especially when you are traveling for long periods of time and don't want to be constantly buying expensive bottled water. It's called the Steripen. It's a small, battery powered (CR123) handheld device that emits an Ultraviolet light that is effective against bacteria, viruses, and protozoa (like that pesky Giardia). So what I've been doing, just to be safe, is filling my Nalgene bottles (yes, I have the new BPA-free ones!) with tap water, zapping them with the Steripen (1L takes less than 2 minutes) and I can drink all the water I want, instantly, and worry-free! The Nalgene bottles are nice to use with this Steripen because you need a nice wide-mouth bottle. The Steripen has a light on it that blinks green if your purification has worked properly, red if it hasn't. I've used it about 10 times so far and only had one red light incident. (I think I may have pulled it partly out of the water while using it. Got the green light on the 2nd try.) Although I tend to prefer fail-safe products that can't break (or run out of batteries), this thing is really useful. You can always carry water purification tablets with you as a fail-safe back-up if you are backpacking or camping. The nice thing about the Steripen is that you don't have to wait 4 hours to drink your water. I'm working on a 2-month long research project in Belize right now, doing what is called an "ethnography" of the Sarteneja fishing community in Northern Belize. I'm looking at the impacts, if any, that the establishment of two marine managed areas (Gladden Spit Marine Reserve and Laughing Bird Caye National Park) have had on this particular community. To do this, I must find and interview the fishermen from this community to see what I can piece together about how their community has changed over the last 10-20 years and what factors have caused those changes. So the first thing people ask me is, "How do you know who the fishermen are?" I mean, they are not always standing next to their boat with a fish in their hand. Translation: "I am a fisherman." On May 14th, 2008, shortly before midnight, a new Moretti joined the family. My brother Mark and his wife Carolina. Welcome, Mr. Lucas John Moretti! 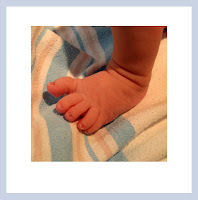 A Baby Lucas foot at 0 days old. An emotional mom and baby. Here's the little guy blinking his eyes open for the first time, with the whole family looking on: He's thinking, "Oh no! Not THIS family!!" Grandma (and Aunt Julie) with Lucas. A couple of crazy Uncles. A family tradition that we've been doing (and arguing over!) 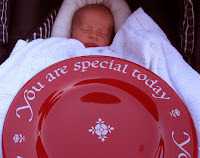 for years is the coveted "You Are Special Today" plate. Let's just say that you've got to do something really significant to earn the right to eat off this plate at Sunday night dinner. (I had to ride my bike 600 miles across Africa to get it!) Lucas now holds the record for the youngest family member to earn the plate (4 days old). We figured "being born" was enough to qualify him for the distinction. He'll have to try a little harder the next time he gets it, though. Today I went up to San Francisco to help my brother with the bottling of the Mark Moretti Winery 2005 Pinot Noir. This was my second visit to the Winery, since I've been so far away from home for so long. I finally had the chance to try a sushi restaurant that I had heard a lot of good things about, the Sakae Sushi & Grill in Burlingame, CA, where we went to celebrate my 35th birthday. I'll start by saying that the best sushi I've ever eaten, by far, was at the Tsukiji Fish Market in Tokyo, Japan (and it was for breakfast!). Sakae is now my 2nd favorite place to eat sushi! This is a great little restaurant, with a very authentic Japanese atmosphere, and the food is fantastic. If you want the good stuff, and you'll pay for it, order off the Sushi Specials menu. Everything on there is flown in direct from the Tsukiji Market 3 times a week. I finally tried something I've never had before but have always been curious about: Sea Urchin. It was, well, interesting. I don't think I'll be ordering it again, but I'll try anything once. And of course I ate my fried shrimp head just like my Japanese friend Hozumi in Saipan taught me! The fish was outstanding, as was the rest of the very large meal we managed to consume. They also have a great selection of premium Japanese Sake. Thanks everyone for a great birthday dinner! I feel like I must make a recommendation here against ordering the Bluefin tuna or the "Toro" or fatty tuna, which is the belly-fat section from (most likely) a Bluefin tuna. I admit that I have tried a piece of each once before in order to try and understand why it is such a prized fish. It is delicious, but your wallet, the environment, and hopefully your conscience will take a hit when you order these items. Bluefin are a very large, impressive species of tuna whose populations are suffering due to the fact that they are slow to mature, because there is such a high demand for them for the sushi market, and because they are difficult stocks to manage due to their migratory nature. If you want to see a live one, go to the Monterey Bay Aquarium's Outer Bay Exhibit and you will be mesmerized by these amazing animals. One ironic fact about the Bluefin at this and other US restaurants is that there is a good chance that it was caught off the East coast of the USA, frozen, flown to Japan, sold at the fish market, then shipped back to CA and onto your plate! A fisherman friend of mine in North Carolina landed a Bluefin once back in 2002. When he got to the dock, there was a Japanese fish market "middleman" there, in the small North Carolina coastal town of Beaufort, waiting to take the last few Bluefin of the season (there is a quota, and when it is reached the U.S. fishery is closed down) to the Japanese market. The three of them are all very experienced fishermen, and there is a very specific technique and procedure that must be followed when landing and bleeding a Bluefin in order to preserve the quality of the meat. They thought they had done everything "by the book" but even so the buyer took a sample of the meat, analyzed it closely, and told them just by looking at the tissue what they had done wrong. They still sold the one large fish for THOUSANDS of dollars. The fact of the matter is that we can use the market system, good old supply and demand, to help influence the fish that restaurants buy for their customers. If people stop ordering it, they will stop purchasing it, and hopefully the populations will recover to a point where they can be sustainably harvested in the future. 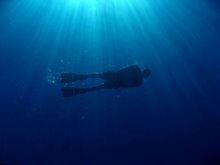 I am a marine resource manager, amatuer photographer, and avid SCUBA diver living on the island of Saipan in the Commonwealth of the Northern Mariana Islands.